Geoscientist Lida Xing was shopping at an amber market in Myitkyina, Myanmar in 2015 when he saw an unusual piece of amber. Trapped inside was a small object that the amber merchants thought was a sprig of leaves. But Xing thought something much more interesting was going on (…) eight fully preserved vertebrae from a young, non-avian dinosaur called a coelurosaur. As an adult it would have been about the size of an ostrich, but this juvenile was still tiny enough to get trapped in tree sap and never escape. 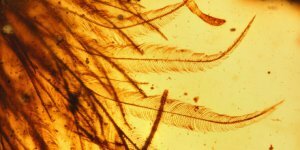 Feathers covered its tail, but at the tip they fluffed out in a pattern that suggested this animal may have had a fan-shaped tail. Bristol University paleobiologist Jacob Vinther told NPR’s Rae Ellen Bichell that this structure also meant that colorful, iridescent feathers may have evolved before ones capable of flight.